North Carolina A&T remains unbeaten and secures sole MEAC title after out-classing North Carolina Central on Saturday. North Carolina A&T is now one step closer to a fairytale ending to its dream season after vanquishing the Big Bad Wolf on Saturday in Greensboro. A&T exercised three years of frustrations on a breezy, sunny day to beat North Carolina Central 24-10 to claim the undisputed MEAC crown and complete a perfect regular season. It was an intense game that sometimes got out of control, with players being ejected during and even before the game, the Aggies used big plays and a stiff defense in the second half to improve to 11-0 on the season. The Blue And Gold Marching Machine makes its entrance. The ladies of Golden Delight in flourish mode. NCCU freshman Chauncey Caldwell on the move. Because you can never have too much Golden. After an eventful, but scoreless first quarter, A&T opened up the scoring via its passing game. Quarterback Lamar Raynard hit Elijah Bell for a 13-yard touchdown pass to give A&T a 7-0 lead. NCCU would respond just before the half with a 52 yard field goal by Aedan Johnson and the game was 7-3 at halftime. The third quarter belonged to the Aggies, who scored on two one-yard runs by Marquell Cartwright to stretch their lead to 21-3 over the Eagles. NCCU, who had beaten A&T three times in a row, added a touchdown by freshman Isaiah Totten to cut the lead to 21-10, but was unable to put up any more points. A&T’s Noel Ruiz’s 31 yard field goal in the fourth quarter capped off the scoring. A&T came into the game knowing it had already clinched the MEAC’s bid to the Celebration Bowl, but there was still a lot on the line coming into the game. The win gave them the outright MEAC title, something it had not done since 2003. It also ended a three-game losing streak to its rival, the one team in the MEAC that seemed to have its number. This season marks the third time in as many seasons that A&T has made it to the postseason. 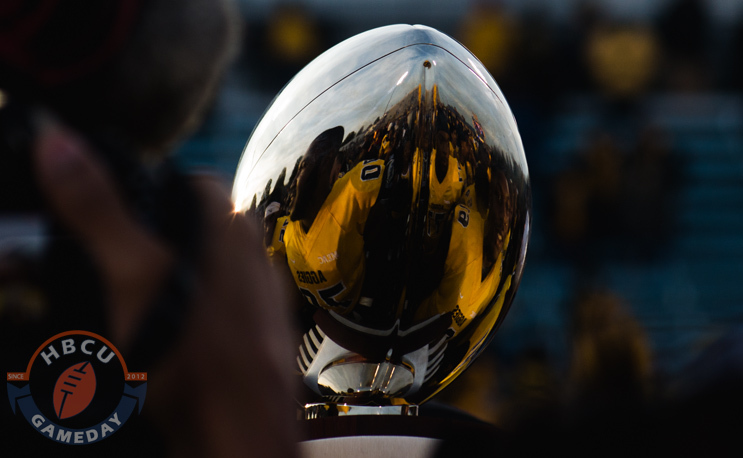 It won the inaugural Celebration Bowl in 2015 by defeating Alcorn State and lost in the first round of the FCS Playoffs to Richmond last year. When asked in the press conference if they would rather try their hand at the playoffs again, both head coach Rod Broadway and his Aggies said they’d rather experience the bowl game.